Sandvik's world leading ranges of mining and rock technology equipment needs no introduction; but now customers throughout Southeast Alaska will be able to benefit from even greater levels of support through its new distributor, Tyler Rental Inc. The appointment of such a professional and experienced distributor reinforces Sandvik's commitment in providing even greater levels of customer focus, and further enhances its commitment to enhanced locally focused customer support, whilst at the same time allowing customers to benefit from dealing with a truly global company. Tyler Rental Inc. is a full-service equipment rental and sales company that has served the construction and resource industries since 1989. 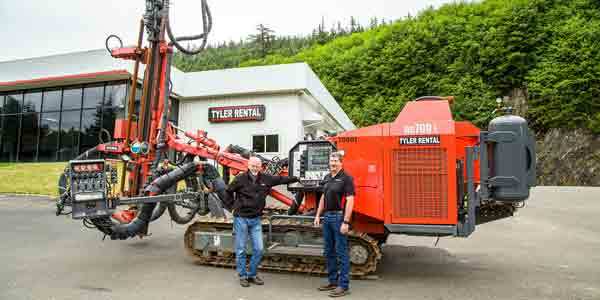 With multiple locations throughout Southeast Alaska and Washington, Tyler Rental has developed a team of professionals with the capability to support its customers in challenging and remote work sites. Becoming an authorized Sandvik Dealer aligns with Tyler Rental's strategy to expand its ability to support underground mining, rock drilling and aggregate producers in Southeast Alaska. "We are extremely pleased with the opportunity to leverage our team's customer service dedication and experience base in Southeast Alaska in partnership with Sandvik," says Randy Johnson, president of Tyler Rental Inc.
Of the appointment of Tyler Rental Inc., Kauko Juuri, Global Distributor Manager Sandvik Mining and Rock Technology states: "We are sure that the combination of Sandvik equipment and global aftermarket support, together with the local knowledge and industry expertise of Tyler Rental will enable Sandvik customers throughout the Southeast Alaska to benefit from a winning combination."